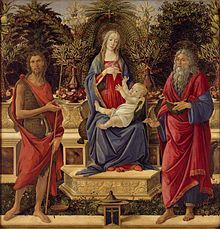 Alessandro di Mariano di Vanni Filipepi (c. 1445[a] – May 17, 1510), known as Sandro Botticelli (Italian: [ˈsandro bottiˈtʃɛlli]), was an Italian painter of the Early Renaissance. He belonged to the Florentine School under the patronage of Lorenzo de' Medici, a movement that Giorgio Vasari would characterize less than a hundred years later in his Vita of Botticelli as a "golden age". 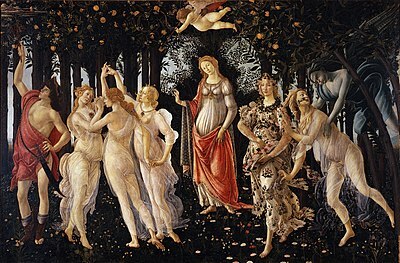 Botticelli's posthumous reputation suffered until the late 19th century; since then, his work has been seen to represent the linear grace of Early Renaissance painting. As well as the small number of mythological subjects which are his best known works today, he painted a wide range of religious subjects and also some portraits. 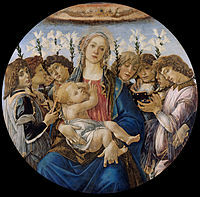 He and his workshop were especially known for their Madonna and Childs, many in the round tondo shape. 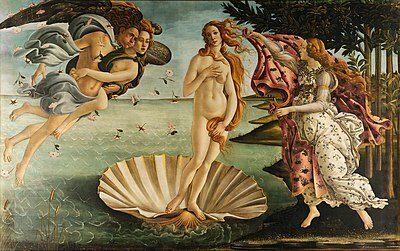 Botticelli's best-known works are The Birth of Venus and Primavera, both in the Uffizi in Florence. He lived all his life in the same neighbourhood of Florence, with the only significant time he spent elsewhere probably being the months he spent painting in Pisa in 1474 and the Sistine Chapel in Rome from 1481 to 1482. The Ognissanti neighbourhood was mostly "a modest one, inhabited by weavers and other workmen," but there were some rich families, notably the very rich Rucellai, bankers and wool-merchants, headed by Giovanni di Paolo Rucellai, whose Palazzo Rucellai by Leon Battista Alberti, a landmark in Italian Renaissance architecture, was being built between about 1446 and 1451, Botticelli's earliest years. By 1458, Botticelli's family had moved to the same street as this,[b] and were renting their house from another Rucellai, and there were other dealings involving the two families. 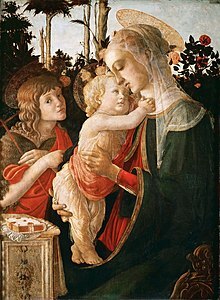 The same year, when Botticelli was 13, his father complained to the Florence Registry that his son was "unhealthy" and "reading". In 1464, Botticelli's father bought a house in nearby Via Nuova (modern Via della Porcellana), which Sandro returned to live in by 1470, where he remained for the rest of his life. He both lived and had his workshop in the house, by now a rather unusual practice, despite his brother Giovanni and his family also being in residence (and later another brother, Simone). On the same street were the Vespucci family, including Amerigo Vespucci, born in 1454. 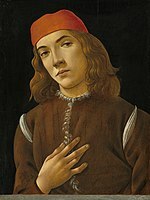 The Vespucci were close Medici allies, and would become regular patrons of Botticelli. The name Botticelli, meaning "little barrel", came from his brother Giovanni's nickname of "Botticello", "apparently from an unfortunate resemblance". By 1470 a document referred to the painter as "Sandro Mariano Botticelli", and it became his customary surname. From around 1461 or 1462 Botticelli was apprenticed to Fra Filippo Lippi, one of the top Florentine painters of the day, and one often patronized by the Medicis. 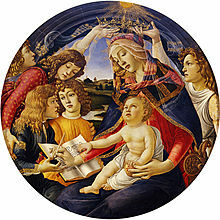 He was rather conservative in many respects, but gave Botticelli a solid training in the Florentine style and technique of the day, in panel painting, fresco, and drawing. 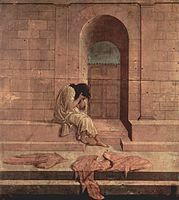 Elements in style and compositions that are reminiscent of Lippi also continued to appear throughout his career. 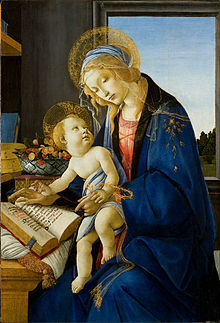 For this period Lippi was based in Prato, just outside Florence, painting what is now Prato Cathedral, and it is there that Botticelli was trained. He had probably left Lippi by April 1467, when the master went to work in Spoleto. It is thought that Botticelli then worked for the naturalist painters the Pollaiuolo brothers and Verrochio, in part based on their shared use of foreshortening and perspective. 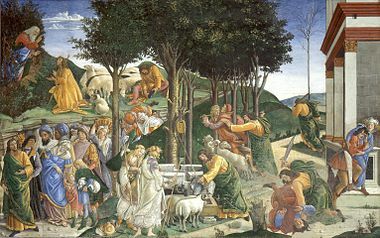 Possibly as early as 1467, but certainly by 1470, Botticelli had his own workshop, which by 1472 included the son of his master, Filippino Lippi. 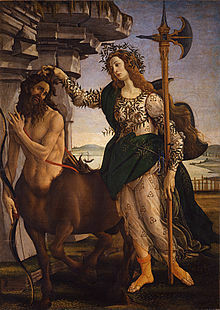 In June of that year he was commissioned by the judges of commercial cases to paint two panels from a set of the Seven Virtues for their court; for some reason, only one, Fortitude (now in the Uffizi Gallery) was finished. 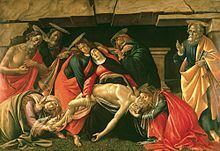 Botticelli both matched his style and composition to the other panels by Piero del Pollaiuolo, and tried to outshine him "with fanciful enrichments so as to show up Piero's poverty of ornamental invention." The Adoration of the Magi for Santa Maria Novella (c. 1475–76, now in the Uffizi, and the first of eight Adorations), was singled out for praise by Vasari, and was in a much-visited church, so spreading his reputation. It can be thought of as marking the climax of Botticelli's early style. Despite being commissioned by a money-changer, or perhaps money-lender, not otherwise known as an ally of the Medici, it contains the portraits of Cosimo de Medici, his sons Piero and Giovanni (all these by now dead), and his grandsons Lorenzo and Giuliano. 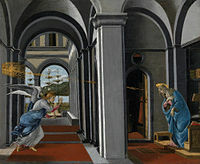 There are also portraits of the donor and, in the view of most, Botticelli himself, standing at the front on the right. The painting was celebrated for the variety of the angles from which the faces are painted, and of their expressions. ^ a b c Based on his father's tax returns, sources range from 1444–46. ^ He was still in school in February 1458. (Lightbown, 19). ^ According to Vasari, 147, he was an able pupil, but easily grew restless, and was initially apprenticed as a goldsmith. ^ GB 1996, p. 11. ^ a b c GB 1996, p. 13. ^ GB 1996, p. 14. ^ Hartt, 324. "Botticelli was active in the shop of Verrocchio". ^ GB 1996, pp. 14–15. ^ "The Adoration of the Magi by Botticelli". Virtual Uffizi Gallery. Retrieved 29 March 2019. ^ "29361 Botticelli (1996 CY)". JPL Small-Body Database Browser. Jet Propulsion Laboratories. 2012-04-09. Retrieved 2014-02-19. 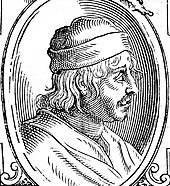 Sandro Botticelli. New York: Gramercy Books. 1996. ISBN 0-517-18217-3.